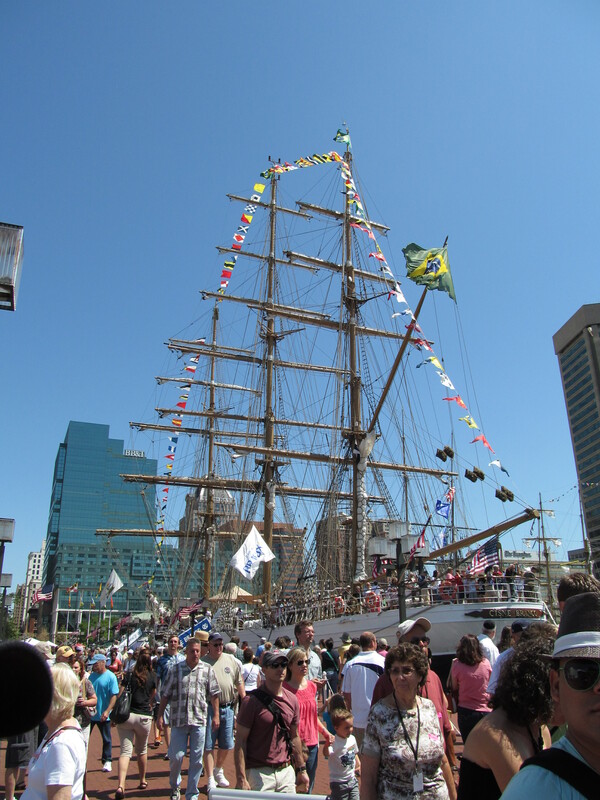 The tall ships were in Baltimore this month. It’s an annual event, but this year also marks the 200th anniversary of the War of 1812. For those of you unfamiliar with it, the young United States was unhappy with Great Britain’s maritime actions. British ships were seizing American ships and impressing American sailors into the British navy. The British also were restricting US trade with France and inciting Native American groups to resist US westward expansion. For various reasons, Great Britain decided this was the time to return the upstart United States to colony status. Not surprisingly, the United States didn’t share this view and declared war. I can’t say the US army won the war. Before the peace treaty was ratified, it won no major battles. But the Merchant Marine was another story. Once fully armed and able to defend themselves, American ships taught the mighty British fleet a thing or two about naval warfare. Caught again fighting too many wars on too many fronts (as they were during the American Revolution), Great Britain was forced to back down and sign another peace treaty with the United States. That one has lasted—to both countries’ benefit. Communications being what they were, news of the peace treaty was slow to reach Louisiana. And in January 1815, American ground forces finally won a decisive battle against the British in New Orleans. There was just one problem. The peace treaty had been ratified two weeks before. The war was already over. Oops. Oh well, it became a great bit of American history and launched the political career of one Andrew Jackson. Today, most Americans know little about the war. It gets more coverage in Maryland (and Washington, DC) because much of the action took place here. The British did burn the White House, after all. And our national anthem, The Star Spangled Banner, was written by Francis Scott Key as he watched the British ships fire on Fort McHenry in Baltimore. The troops at the fort held their ground. When dawn broke, the American flag still flew high. 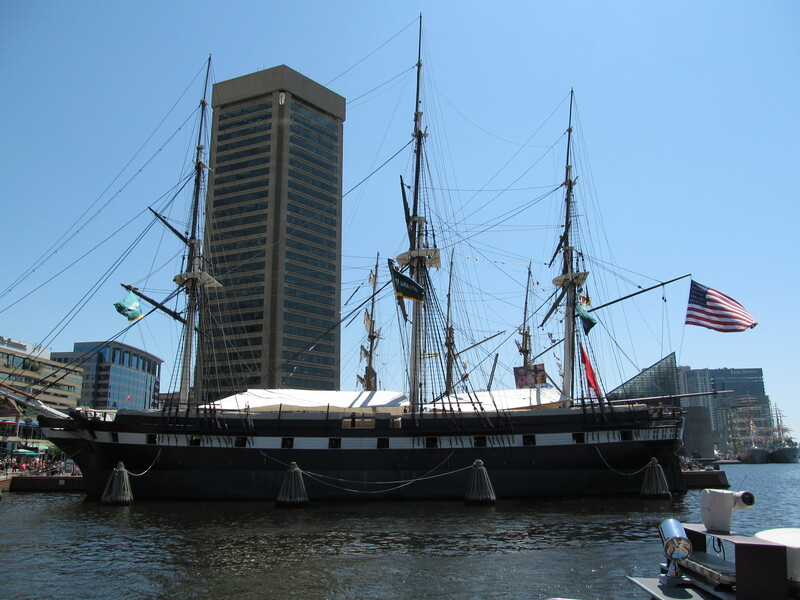 The ships in Baltimore were a great sight. Unfortunately, most of the American ships were over at Fort McHenry, and we were at the Inner Harbor. 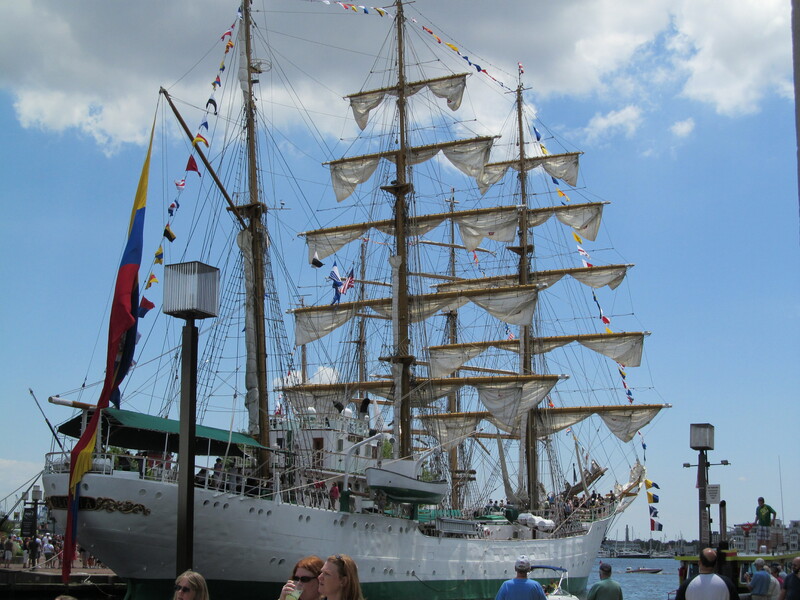 Most of the ships we saw were from Latin America. But they were still fun to visit. I hope you’ll enjoy the photos. The Colombians handed out candy when you boarded and disembarked. This entry was posted in writing and tagged Baltimore, Battle of New Orleans, Maryland, Star Spangled Banner, tall ships, War of 1812, writing. Bookmark the permalink. ← That Search Led You Here? Got lost! William who and John who? Wow! That’s kinda what I thought. Makes for interesting history. My claim to fame is distant relative (cousin) of President William McKinley. Not related to any presidents I know of, but some of my ancestors knew Abraham Lincoln as a boy in Kentucky. Hi. Your post today evoked memories for me. When my daughter was just 16 she sailed on one of the tall ships from Spain to Ireland in a Force 10 storm. Apparently the entire body of youngsters ranging in age from 16 (she was the youngest) to about 20 were hanging over the sides saying goodbye to the contents of their stomachs. What a nightmare for the crew! Anyway she returned home safely having had a taste of adventure and she has never stopped seeking it since. Today there was a beautiful tall ship sailing off of the Dorset coast with most of her sails up. That was a truly majestic sight. Regards and thank you for my trip down memory lane. Oh, I’d love to see one of these beauties under full sail. 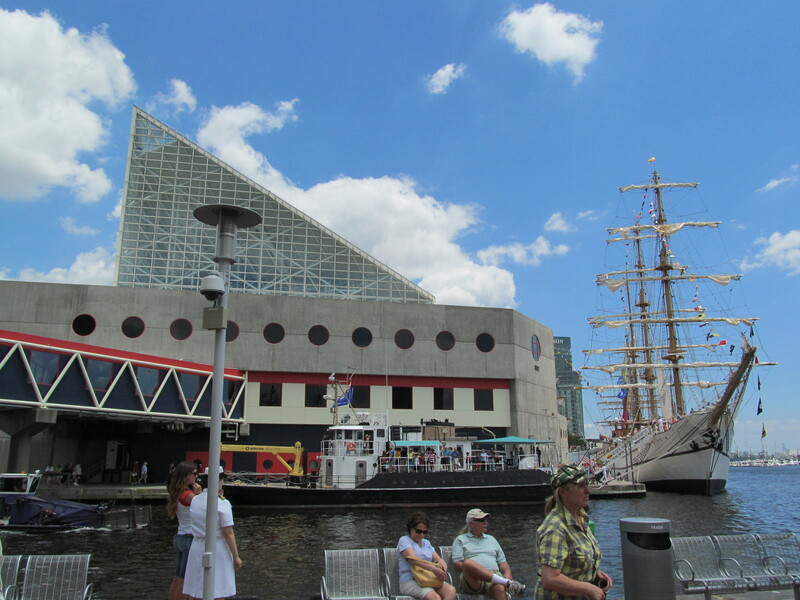 We didn’t even try to brave the crowds in Baltimore on the days they sailed in and out of the harbor. The estimates were for a million visitors during the week they were here. And with such beautiful weather, I’ll bet there were more. I can’t imagine being on such a ship in a large storm. If I remember correctly, it was the original Pride of Baltimore that was lost in a race during a freak “microburst.” But on smooth seas? What an adventure that would be! Did your daughter keep sailing, or was that experience haning over the side enough for her? Indeed she did keep sailing and went on to teach both it and windsurfing as her summer jobs during university. It just goes to show that you can’t keep a good woman down. Those are gorgeous photos! Looks like the weather was beautiful for viewing the ships. You’re right–I’ve never known much about the War of 1812. The part about New Orleans was a great detail to hear about. Thanks for sharing your historical knowledge! It was a perfect day—not too hot, a nice breeze, and low humidity. The War of 1812 is a “forgotten” war, even though it was our second war for independence. But other than the Mid-Atlantic, most of the land battles were fought on frontiers with few residents. So you don’t have the commemorations of battlefields like you do for the Revolution and Civil War. The Battle of New Orleans is an interesting footnote in history. 🙂 If only the telegraph had been invented by then….! If we’d shuttled over to Fort McHenry, some of the racing tall ships were there along with some European naval ships. There would have been more camera candy! But there’s only so much time in a day. 🙂 Maybe next year, though! I enjoyed your blogging deviation. My knowledge of history is sad. I like to blame my former history teachers–very dull orators. 😉 Had they put in personal bits and lovely photos like you did, I might have retained more. 🙂 Sounds like it was a great day. Oh yeah, why do so many teachers make history boring? It can be fascinating! But too many get hung up on dates and places. They forget, or never realized, history is about PEOPLE. Get students to use their imaginations and think about what they would have done. Have them talk to their parents and grandparents and find out who some of their ancestors were. Well, that’s good to hear! I went to a very progressive middle school for 6th and 7th grades. I had a class called “Herstory” one semester. It was probably curriculum shattering at the time. 🙂 But there is certainly more to the past than white males (especially of the silver-haired Anglo-Saxon protestant variety). Great photos! And I think it’s neat that you actually know so much about your own family’s history. My family only immigrated to the US around 1890-1900, so information about them any farther back has been difficult to find. I agree, genealogy is addictive. Every time I pick it up again, I wonder why I ever stopped. Language is a barrier for me, too, even when it comes to the American records of my family. It’s painfully obvious that the records were made and transcribed by those who didn’t speak the same language as my ancestors. I’ve seen some pretty horrible misspellings of their names. When I saw how “creative” people in the past were with McDowell, I could better understand how bad it could be with more “foreign-sounding” names. There were some butcherings of my mother’s maiden name! great bit of information!! Thanks for taking the time to share. 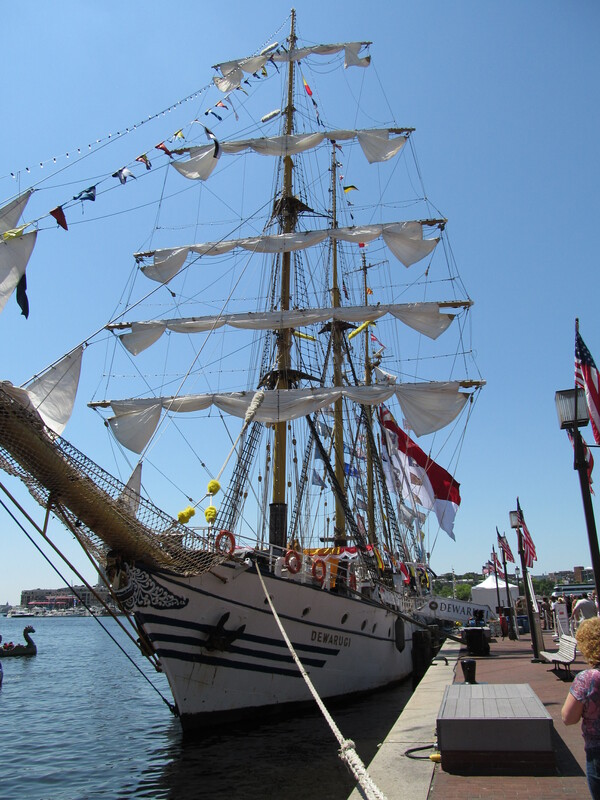 I was in Baltimore when I was about 12 and saw the tall ships. So cool. I completely forgot about the experience until I read your post. It’s hard to take a bad photo of such beautiful ships. 🙂 We had a great time that day, and it just seemed like a fun summer post to do. The Inner Harbor’s gone through a major renewal, beginning with the new Orioles stadium back in the 1990s. I wouldn’t want to live in Baltimore, but it’s fun to visit that area. I can also remember HOT and HUMID. That was this past week! This is interesting even if you are all “traitors to the crown” 🙂 My wife loves ships, had we been on the East coast I have no doubt we would have been there (we did an east coast road trip on our honeymoon). Good way of putting some background and context to the pictures. I hoped English readers wouldn’t be too ruffled by the lighter tone I took. 🙂 And, of course, what might the Queen say of you moving to this side of the pond? 😉 I’ve enjoyed my visits to the “left coast,” but I am partial to the Atlantic side of things. So different from what I grew up with in mostly-landlocked Illinois. Well the right side has more history primarily because it is closer to Europe, so I think that has made that side a bit more interesting in terms of places, though I think there is little difference in terms of scenery, as there are beautiful places to visit on either side. You definitely have the advantage of scenery options in California. Being able to swim in the ocean in the morning and then drive up to the mountains to ski in the afternoon is quite a perk. This post really brought back memories!! I may have mentioned it before, but we lived in Fairfax VA from 1983-1988 and took many a day trip to the inner harbor (annapolis, too…my FAVE!!!) Seeing your pic of the ship docked by the Aquarium has me remembering LOTS of fun times, and my BIG hair…eeekkkk!!! better left forgotten! hahahahahahahaha!! Anyway, your photos are gorgeous, but the geneology and history you shared is equally great! I was hoping people wouldn’t fall asleep with my history lesson in this one! 🙂 So I’m very glad you and others enjoyed it! Lovely photos! 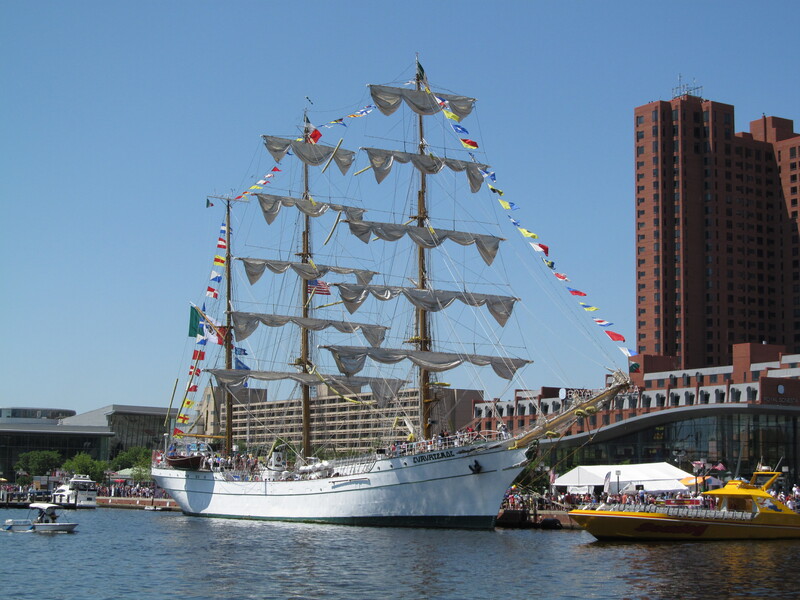 It’s quite an experience to see the tall ships, they are beautiful. Thank you, Clowie! Just getting the chance to see them up close and walk through them was such a treat. I’m glad you enjoyed the story with the photos. I was a little afraid people would be turned off by a history lesson, even a short one with a bit of humor in it. I want to try a few different posts now and again to try to keep things fresh. I’m never quite sure how they’ll go over…. Fascinating! I would love to tour one of these sometime. Can you imagine actually sailing on one? Nice history lesson. Would love to tour the ships, if I’m ever in the areas at the right time. I’m from Louisiana so I’m a little familiar with the battle of 1815. Thanks for stopping by and visiting! They do get around to a number of ports, so if you do cross with them, I’d definitely recommend a visit. I’m truly impressed by sailors who could “learn those ropes.” I’d make a mess of it, for sure. Louisiana’s probably the only state outside of Maryland and Virginia that knows much about that war. I’ve visited New Orleans a few times and love its history (and food and music….). That they are! And even more impressive when you see them up close. Beautiful photos! I saw the Tall Ships when they were in NY a few weeks ago—I would have loved to have seen them in Baltimore too with the 1812 anniversary. And my husband is from B’more so he’s been dragged to Fort McHenry more times than he’d care to count! It’s hard to take a bad photo of such impressive subject matter. 🙂 And the humidity was low, so the sky was such a pure blue — no gray haze anywhere. A beautiful day for using the camera. Thanks for the follow — when I get a chance, I’ll be visiting your blog! Great post, JM. History is one of my favorite subjects, particularly American history. The War of 1812 is the kind of topic teachers mention in passing. They should devote more time on it, as it was our second war for independence. If we had lost it, things would be quite different. I love the Louisiana tidbit. I had actually forgotten that piece of it. Thanks for jarring my memory. I also loved your personal history to go along with the story. I’m sure I had relatives who fought in it, as I had relatives fight in the Revolutionary War and the Civil War. This is something I need to ask my mother–she’s the geneaology buff of the family. I think the only thing I learned in school about the War of 1812 was the fact that it happened and the Battle of New Orleans was fought after it was over. But it strikes me as a huge “What If” event. What if the British had a decisive edge? Would France and other countries have come to our aid? Or would they have let the British regain control? I’m sure there’s an “alternate history” novel in there! Pictures are excellent and give perspective on how tall they really are. Ooh, I could never take that kind of work. I would fall overboard for sure, after losing every meal I ate that day before the storm came up!